What is Surgical Debridement of Bed Sores? 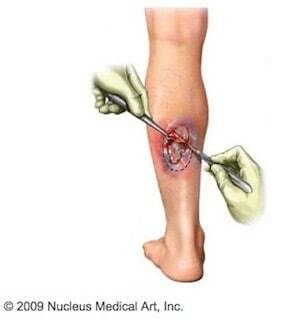 Surgical debridement of a bed sore is the removal of dead or unhealthy tissue from an open wound. Where Do Bed Sores Tend to Form? There is no part of the body that is immune to forming bed sores. They can form anywhere, but there are certain parts where they will more readily develop. The location of the sore depends partly on the position the person is in when they are immobile, and partly on whether they are in a bed or a wheelchair. How Serious Can a Bed Sore Become? Stage I. A first stage bed sore is just forming and has not yet broken the skin. The incipient bed sore presents as a red patch. Later on, this patch may darken and turn more purple. The bed sore may itch but pain is minimal. It may be swollen, warm and harder than the areas around it. Stage II. In stage II, the skin is breaking open. Abrasions will probably appear and there may be a blister filled with pus in the open wound. The wound is now definitely painful but still shallow. Stage III. The wound is now an open crater and the bedding is red. The pressure sore will be very painful. The skin has degraded entirely and the underlying tissue is visible and becoming damaged. Stage IV. In stage IV the tissue has degraded and the muscle and bone are visible. This is a life-threatening condition. What are the Treatment Options for Bed Sores? Debridement. This is the removal of dead and unhealthy tissue from a bed sore or other wound. Surgical debridement is one way to accomplish this, but there are other forms as well, such as chemical, mechanical, biological and even autolytic debridement. The kind of debridement is for the doctor and patient to decide together, or the patient's legal representative. Wound vacs. A specialist uses a wound vac to drain a bed sore of leaking fluid, which protects against infection as well as promoting healing. An airtight seal covers the wound and a pump then drains the wound. Flap reconstruction surgery. In a patient who has lost tissue and skin, flap reconstruction surgery may be necessary to close the wound. A surgeon can take healthy skin from somewhere else on the body and transplant it to the wound site. Colostomy. Human waste can infect a pressure sore, as well as increase the incidence rate for bed sores. A colostomy bag collects the waste before it soils the patient and helps keep bed sore from getting worse or even forming in the first place. Amputation. This is the surgical removal of part or all of a section of the body. It may be necessary in extreme cases where necrotic tissue threatens the patient's life. Chemical debridement. Chemical debridement of a wound involves the use of enzymes to eat away at the dead tissue and promote the growth of healthy tissue in its place. Autolytic debridement. Autolytic debridement makes use of the body's own enzymes. An attendant places a moist dressing over the wound and the body is allowed to heal itself. This may not be an option for patients whose bodies are too weak to heal themselves. Surgical debridement. A surgeon may use a scalpel to remove the dead tissue from an infected wound. Usually, this procedure will also require some sort of reconstruction of the wound. Surgical debridement is often a last resort because recovery can be long and painful. Mechanical Debridement. A painful method of wound cleaning, with mechanical debridement one places a damp cloth on the wound and allows it to dry. The attendant then rips the cloth away, which tears away the dead tissue and usually some living tissue, too. What Devices or Products can be Used to Prevent or Relieve Bed Sores?